This sweet young Eastern Rosella was brought to me needing care. I could do little for it as it had the acute form of this disease as is most commonly observed in young or fledgling birds during their first feather formation after replacement of the neonatal down. Chicks as young as 2 months of age have been described with classic PBFD feather lesions. These infections may be characterized by necrosis, fracture, bending, haemorrhage, or premature shedding of developing feathers. Chicks that develop clinical lesions while the majority of feathers are still in the developmental stage exhibit the most severe feather pathology. The clinical progression of disease is less dramatic in young birds that develop clinical signs after body contour feathers are mature. In these birds, feather changes may be limited to the still developing primary flight and tail feathers. 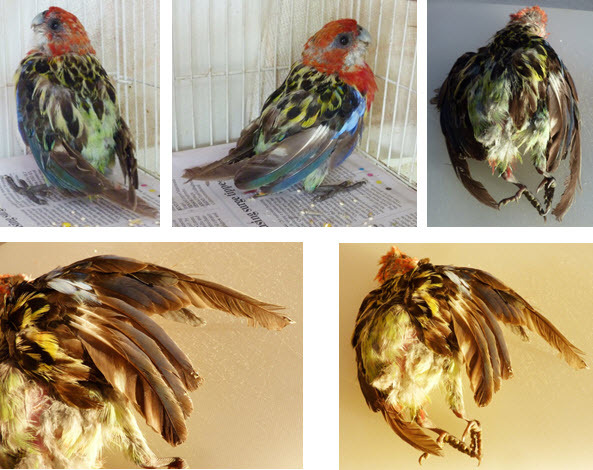 In some acute cases in young birds, PBFD may manifest itself as depression, anorexia, crop stasis, and diarrhoea followed by death in 1 – 2 weeks. Since these birds are covered only with neonatal down, no feather abnormalities will be observed. This clinical picture appears to be particularly common in young cockatoos, African greys, and lovebirds. A more chronic form of the disease is observed in older birds in which dystrophic feathers, which stop growing shortly after emerging from the follicle, appear during each successive moult. 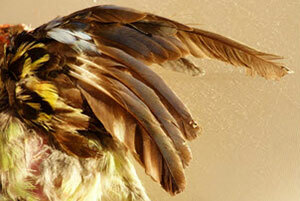 The powdery down feathers located over the flank region are typically the first to show signs. The disease then progresses to involve the contour feathers in most feather tracts, followed by dystrophic changes in the primary and secondary feathers of the wings, tail, and crest. PBFD is generally considered fatal, with most infected birds surviving 6 months to 2 years after the onset of clinical signs. The PBFD virus is immunosuppressive and death usually occurs from complications due to secondary bacterial, viral, or fungal infections, or from terminal disease changes which necessitate euthanasia.